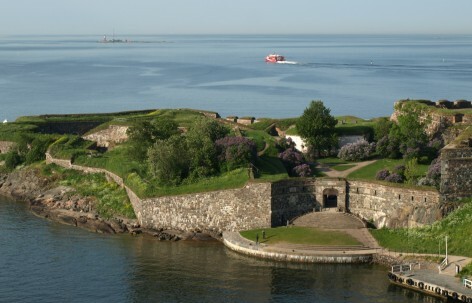 The King’s Gate is the iconic symbol of Suomenlinna. It was built in 1753–54 as the entrance gateway to the fortress. The gate was built on the site where the ship carrying King Adolf Frederick of Sweden, was anchored while he inspected the construction of the fortress in 1752. The façade of the two-storey King’s Gate is concave, and the gate, framed with marble stones, is made with rustic masonry. In the 1770s the gate was transformed into a double drawbridge. A quay and wide stairs, constructed from limestone excavated from a site near Stockholm, were built in front of the drawbridge. The ornamental motifs of the gateway consist of limestone cornices, oval and round embrasures and inscribed marble slabs. Bombardments during the Crimean War destroyed the quay and some of the steps at the King’s Gate. The King’s Gate was refurbished for the first time during Finland’s independence in 1925, for a visit by the King and Queen of Sweden. Since then, the gate has been refurbished three times. The most recent restoration work was completed in time for Suomenlinna’s 250th anniversary in 1998. From the King’s Gate you can watch large cruise ferries navigating the Kustaanmiekka strait on their voyage between Helsinki and Stockholm. Some of the international cruise ships also sail through the strait and past the King’s Gate. The King’s Gate is about 1.5 km (1 mile) from the main quay. During the summer season, a waterbus stops at the King’s Gate quay.